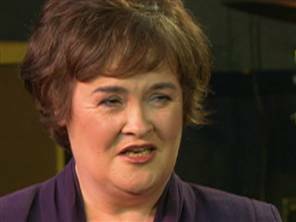 Britain’s Got Talent’s Susan Boyle looked make-over mod when she met her British idol, Elaine Paige on the Today show. Elaine could perhaps be compared to an American version of Barbra Streisand: extremely talented and well-liked by fans. mentioned she was “gobsmacked” to meet her very own idol as the interview continued. which he congratulated her on her success and predicted that they’ll do a recording together. sister Marie and then said in jest that he’ll dump Marie to perform with Susan Boyle instead.